To my mind, there is little more heavenly and evocative than the flavour of smoke. Smoke adds a depth and muskiness that makes the base flavour of whatever is being smoked more luxurious. I always keep a plait of smoked garlic hanging in my kitchen, the smell pervasive and nostalgic, reminiscent of the smell on my father’s clothes when he came down from tending the bonfire in the top garden. The act of smoking food started primarily as a means of preservation, but the flavour that it gives elevates the practice to an art form. 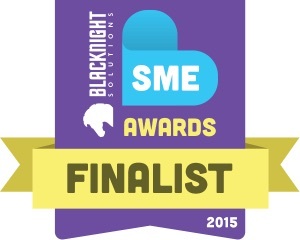 In Ireland we are particularly lucky in the abundance and calibre of our smokehouses. Cork especially hails some of the finest – including Frank Hederman’s Belvelly Smokehouse, Sally Barnes’ Woodcock Smokery, Ummera, Fingal Ferguson’s Gubeen Smokehouse as well as some excellent examples in the West, such as the Burren and Connemara Smokehouses. While the Irish smoking tradition is dominated largely by the smoking of fish and mostly by salmon, many of the Irish smokehouses as well as other individuals smoke a wider array of foods and create infinite variations by smoking over different woods. Ed Hick is a man whose bravery with flavour marks him as a vanguard of culinary boundary pushing, evident in the bacon jam and the deer jam that he launched at the 2012 Wild and Slow festival. His smoked wild Irish venison does not disappoint, it is as rubied as claret and melts on the tongue like butter. While he recommends it to be sliced paper-thin and served with Wicklow Baun cheese, I prefer thick slices dipped in olive oil and a dash of balsamic. The smokiness comes first and beckons the gaminess behind it. The smoke is transformative; it accentuates the gaminess to its highest echelons. Ed has experimented extensively with smoking over different woods and materials to achieve different results and found that the flavour achieved by different smokes was astounding in spectrum. The materials chosen for smoking are as important as the quality of the product that is to be smoked. Frank Hederman, for example, favours beech wood chips that are specially made for him in the UK, while others favour the traditional Irish use of oak shavings, including the Burren Smokehouse and Ummera. Over Christmas I had the pleasure of tasting one of the most exciting Irish ales I’ve ever come across. Cúl Dorcha is brewed by The West Kerry Brewery (Beoir Chorca Dhuibhne), which is Europe’s smallest and most westerly brewery, tucked away on the Slea peninsula and creating hand-crafted, cask conditioned ales and stouts. Cúl Dorcha is an amazing example of smoked beer and a real symbol of great Irish taste – every mouthful starting with caramel and toffee and rounding off with robust peat smoke. It is a wonderful variant on the German Rauchbiers (smoked beer), which achieve their smoked flavour by drying malted barley over beech wood log fires. 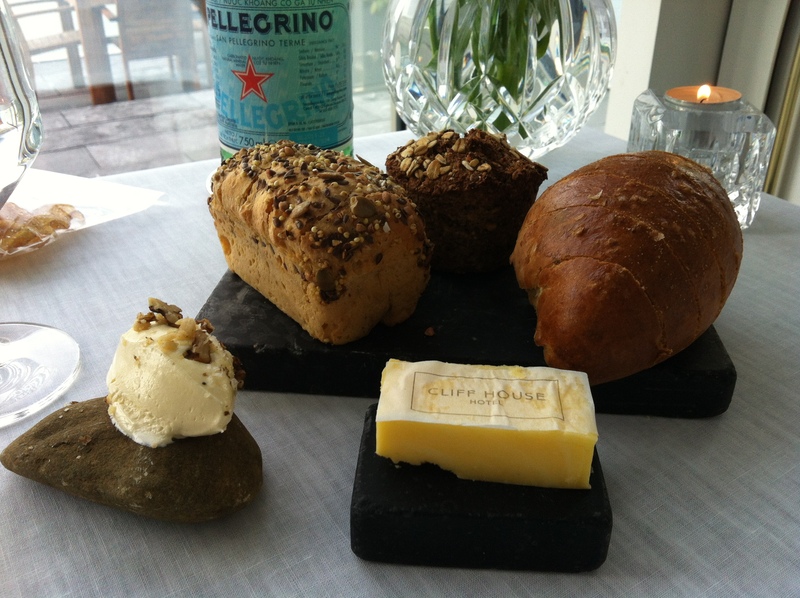 One of the most incredible things I have ever tasted was smoked butter at The Cliff House hotel in Ardmore, Waterford. When embarking upon the epic genius of Martijn Kajuiter’s Michelin starred food, the last place you expect to find the pinnacle of edible glory is in the butter dish. Or in this case, served on a stone, the consistency of dense clotted cream and a flavour so perfect I could have happily have eaten only bread and butter and still felt I had a Michelin starred meal. Smoked sea salt is becoming increasingly popular and something that I feature frequently in my baking; salt brings out the sweetness of chocolate and the addition of smoky overtones further elevates the flavour. One of Wildflour Bakery’s signature cookies is dark chocolate, smoked sea salt and cayenne, a flavour combination that is both elegant and playful in equal measures. I designed this cookie to be enjoyed with Cabernet Sauvignon, although I was delighted to hear from customers how they liked to pair it, for example one that enjoy them with peated single malt scotch such as Laphroaig. You can only imagine my joy when I discovered my two favourite things could be combined – tea and smoke. A seemingly incongruous pairing, lapsang souchong is a Chinese black tea smoked over pine fires giving it an intensely smoked flavour and aroma. As a tea simply for drinking it is superb, but it also presents the opportunity to get the flavour of smoke into syrups and caramels. I was recently given the privilege of designing three recipes to be showcased on Donal Skehan’s blog. I took the opportunity to indulge my personal passion for smokey flavours and I designed a Pear, Vanilla & Smoke cake, the element of smoke being achieved by infusing cream with lapsang souchong tea leaves and then using it to make caramel. The smokiness of the caramel is counterpoised by the aromatic freshness of the pear and the nutty dark chocolate pulls the contrasting flavours together. Melt the chocolate and butter in a large heatproof bowl over a saucepan of simmering water. Stir intermittently with a spatula to melt and incorporate. When it is fully melted, turn off the heat but leave the bowl in the pan. Add the two kinds of sugar and use a whisk to incorporate them. When fully mixed in, remove the bowl from the pan and set aside for the mixture to cool slightly. While it is cooling, preheat the oven to 175°C and grease a brownie pan (13” x 7.5”) with melted butter and line the bottom and short ends with a long strip of parchment. Break the eggs into a jug, add the vanilla extract and beat together. Sieve the flour, cocoa and salt together and set aside. The chocolate mixture should now be slightly cooled, gently whisk in by hand the beaten eggs in two additions, ensuring the first is fully incorporated before adding the second addition. Next use a spatula to fold in the flour/salt/cocoa until just incorporated – do not over-mix. Pour about half of the mixture into the prepared pan and use the spatula to spread it in a thin, even layer. 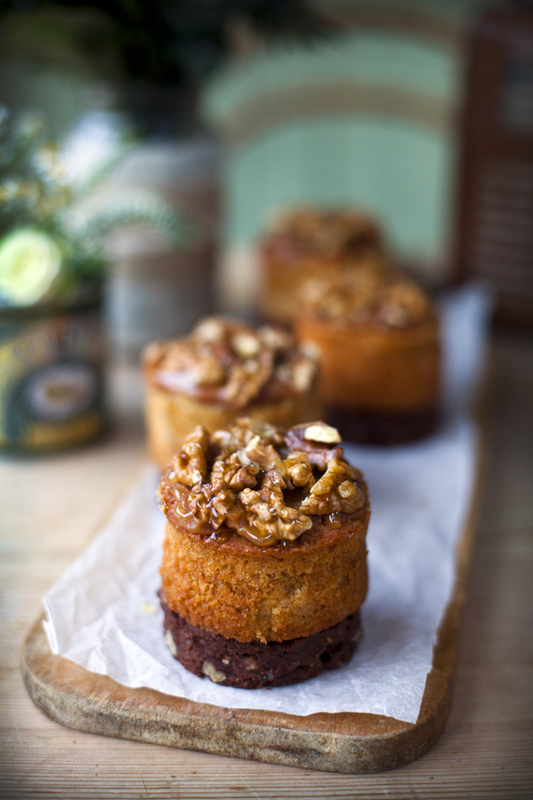 Sprinkle the coarsely chopped walnuts all over the chocolate layer and then cover with the remaining mixture. Make sure it is as even as possible. Pop into the middle shelf of the preheated oven and bake for 20 minutes, turning halfway through. Cool in the pan on a wire rack and then carefully remove it from the pan when completely cooled. Use a 6.5cm diameter mousse ring to cut out 8 circles and set them aside. These will form the bases of the cakes. Cut the remaining off-cuts of chocolate base into chunks and store in an airtight jar for snacks. Stored in this way, they will hold for up to 10 days. Infused cream (for the caramel): In a small pan bring 100ml of organic cream just to the boil then remove from the heat. Add 4 teaspoons of the lapsang souchong tea leaves, stir and leave to infuse for 30 minutes. Use a tea strainer to strain the cream into a jug and set aside until you are making the caramel. Smoky syrup (for the sponges): Pour 250ml of boiling water over 4 teaspoons of lapsang souchong tea leaves and let infuse for 30 minutes, then use a tea strainer or fine sieve to strain the tea into a small pan and stir in 80g caster sugar. Stir slowly over low heat until the sugar has fully dissolved and then bring to the boil and remove from the heat. Set aside. Preheat the oven to 170°C and use melted butter to grease 8 mousse rings (6.5cm diameter) and space them out on a baking tray lined with parchment. Sieve the flour, baking powder and bicarbonate of soda together and set aside. In a stand mixer fitted with a paddle, cream the butter and then add the sugar and beat until light and fluffy. Split the vanilla pod and scrape out all the seeds with a teaspoon and add to a small jug. Break in the eggs and beat together with a fork, then gradually add to the butter and sugar beating constantly until incorporated. Add a third of the flour mix and beat until incorporated, then add a third of the yogurt. Keep alternating the flour and yoghurt they are both fully mixed in. Peel and dice the pear into approximately 0.75cm chunks and fold into the batter mix with a spatula before filling the mousse rings three quarters full. Bake in the centre of the preheated oven for 20-25 minutes, turning halfway through. Check they are cooked by piercing the middle of each cake with a toothpick, which should come out clean. 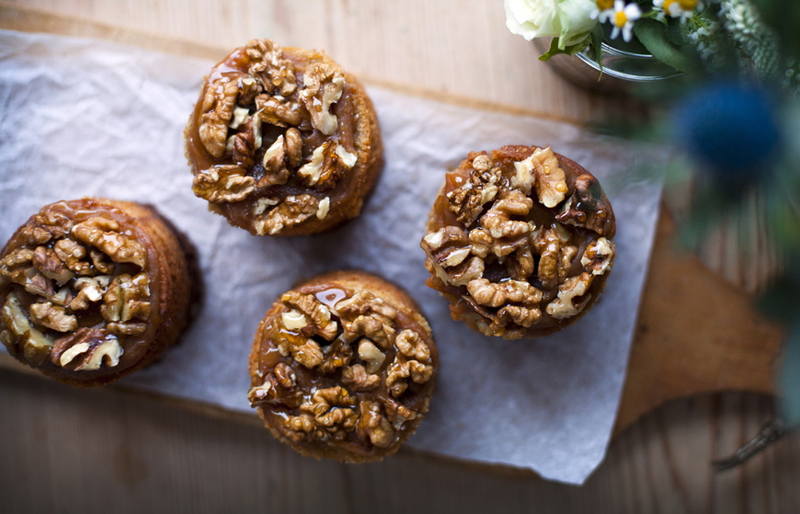 Slide the parchment – with the cakes in their rings – onto a wire rack to cool. When the cakes are cool enough to handle, use a long-bladed, sharp knife to slice off the top of each cake using the top of the ring as your guide. This gives a flat top for the nuts and caramel, but also open the ‘pores’ of the cake so that it will better absorb the smoky syrup. 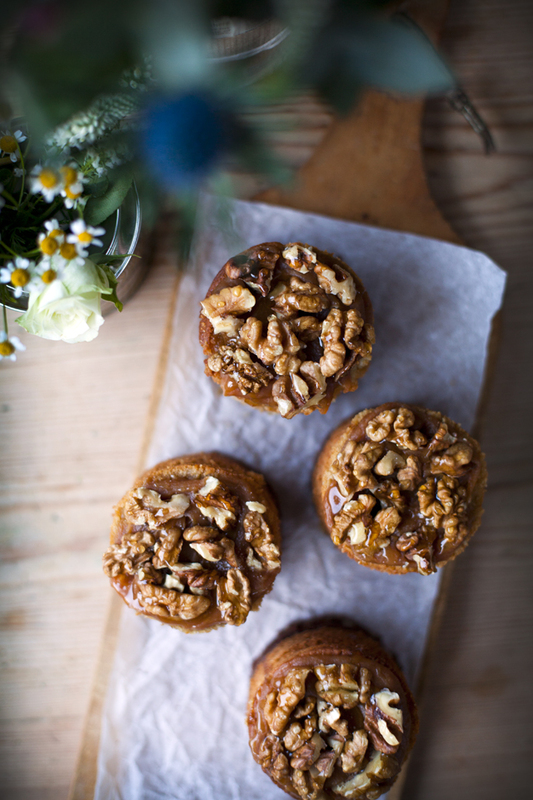 Carefully loosen each cake from its ring and from the parchment underneath, but leave them sitting in the rings. 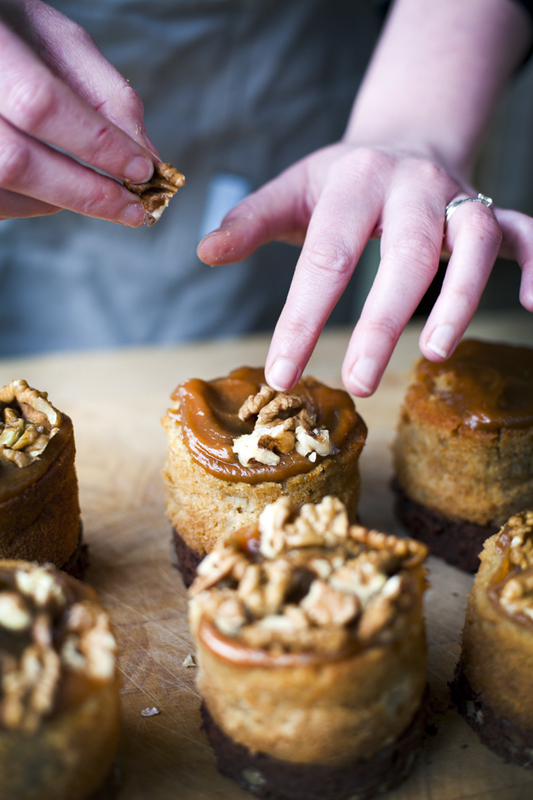 Move them, still on the parchment, into a dish with sides to catch the excess syrup when you pour it into the cakes. 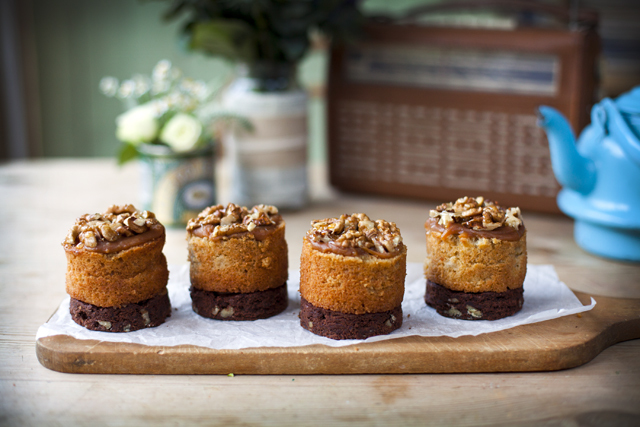 Deeply pierce the cakes with a toothpick and then carefully spoon the smoky syrup over each cake. Leave to soak up the syrup while you make the caramel. Put the 4 tbsp of water into a medium large, heavy-bottomed pan and then pour on the caster sugar. Stir together over low heat to dissolve the sugar and then turn up the heat to medium and leave – without stirring – to caramelize to a dark, nutty amber colour. Meanwhile, reheat the infused cream in a small pan and then remove from the heat as it reaches boiling point. When the sugar has reached the correct colour, turn your extractor fan on high and using a long wooden spoon stir the cream into the caramel. It will hiss and bubble up furiously so stand back until it settles down, but continue stirring throughout so that it doesn’t form lumps. When it stops hissing, add the butter, small lump by small lump, stirring in each then adding the next, until it is all incorporated. Pour the smoky caramel into a bowl to cool slightly. It will thicken as it cools. 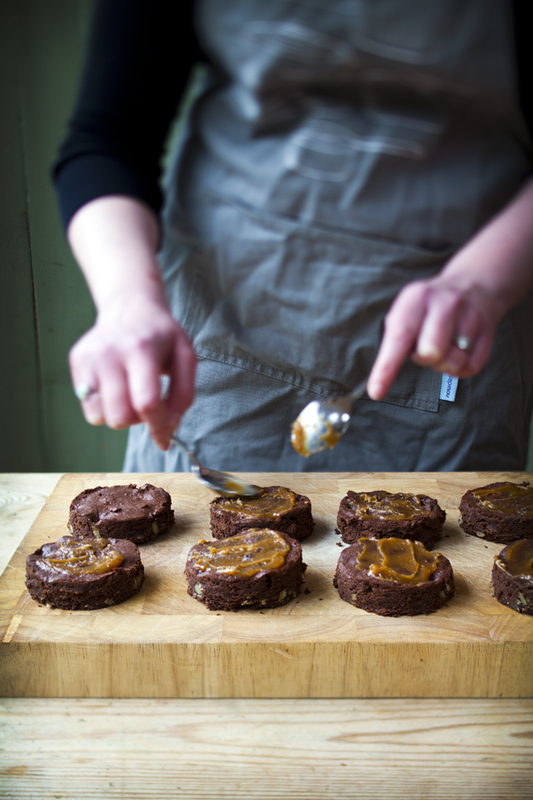 Lay out the chocolate bases and spread each with a little of the smoky caramel. Line up the moist sponge cake on top, using the mousse rings as a guide if needs be. 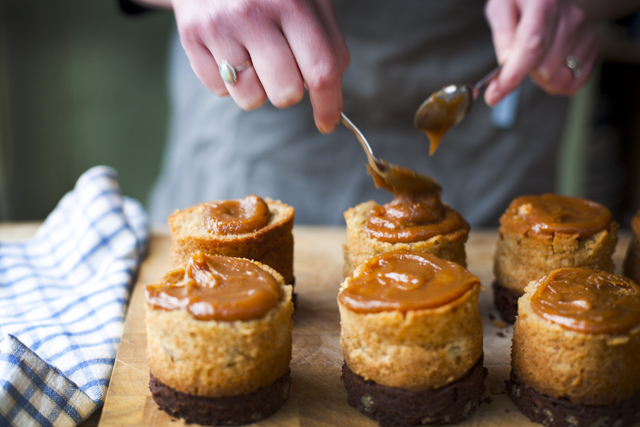 Next, generously spoon and gently spread more smoky caramel on top of each cake and then add the toasted walnuts, drizzling them with more caramel and brushing them with a little remaining smoky syrup. The original post on Donal Skehan’s blog can be found here and the recipe here. All photos of the Pear, Vanilla & Smoke cakes are by Donal Skehan, to whom I give my sincere thanks for allowing me to reproduce the images on my blog and for featuring Wildflour Bakery on his. He has made himself a friend for life. Thanks Angela. Smoked salt is out of this world, you’re going to love it! Dublin outlets selling the lovely smoked chorizo from Fingal Ferguson’s Gubeen Smokehouse include the Lilliput Stores in Stoneybatter. Warning: It’s also quite hot and spicy.